JSTS is a club whose primary focus is on social rather than competitive riding. Please check out information we've added about some upcoming Regional Events. BUCKLE UP A HELMET TO SAVE A LIFE! IT'S THAT TIME AGAIN. Please read "Club dues explained" first. You can join JSTS online, or print and sign the paper application from the web site [membership page] and mail it with your payment. The password given to all dues-paying members upon registration for accessing club routes, etc. is deployed on the first of the year. - When you have bicycle damage, be sure to get an inspection for possible unseen problems. A cautionary tale. Remember, sharing the road is a two-way street! 1) Cyclists are now required to STOP for pedestrians in crosswalks. This is the same requirement as for any other vehicle, changed from the former Yield. 2) Car back.... CAR BACK!!! It's heard many times... What does it mean, and what are we supposed to do? While NJ DOT operating regulations require us to travel no more than two abreast when traffic is not impeded, when a car is approaching from the rear we should move to the right and ride single-file so that the car can safely and easily pass. Even if there is plenty of room for the car to go around, we should ride single-file until the car passes. This is where sharing the road comes in and works two ways. Read the full text of the NJ DOT operating regulations for cyclists here. We all know about the importance of wearing a helmet while riding (for one thing, the club won't let you ride along without a helmet). 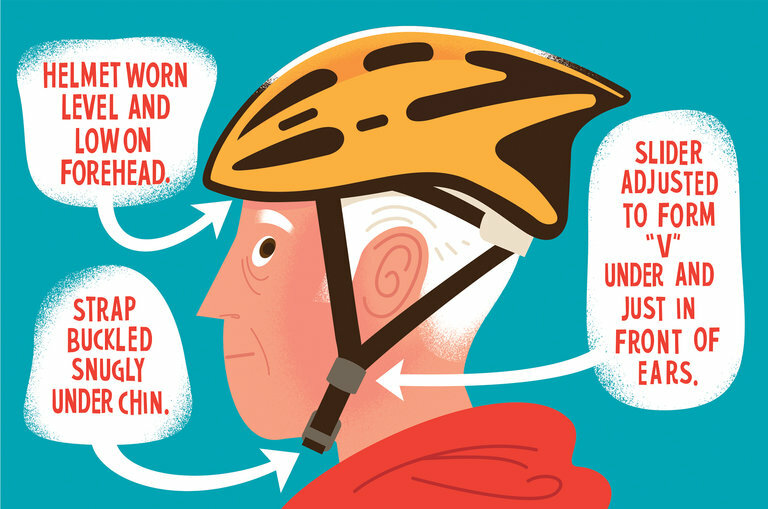 But did you know that the protection a helmet provides is greatly reduced if it isn't worn properly? Click here to read what the National Highway Traffic Safety Administration has to say about how to properly fit a bicycle helmet. Find Useful Cycling Info in the DOT NJ Bicycling Manual.